Last year in September I wrote a post about my newfound ideal skincare routine. It involved doing absolutely nothing to my skin except washing my face twice a day. I kept it up for a few months and it kind of worked, until I flew back to Europe over Christmas and my skin turned into a desert.My skin is naturally on the dry side, however since I live in New Zealand I haven’t really experienced THE REAL WINTER: Wellington is very wet even when it’s cold, so in the past year and a half I’ve had to deal with different skin issues. But while in Italy I knew I needed some extra moisture. Since I hadn’t brought any face cream with me, I thought I’d be a good idea to hunt for something locally made and as Zero Waste as possible. My mum is a big fan of L'Erbolario (they are awesome: all their products are cruelty free and locally made, mostly packaged in glass, and the company is really into environmental sustainability and social responsibility), so we went to one of their shop where I purchased this amazing face cream which I mainly picked because it smells delicious (it’s made with Argan leaves) but also because it was recommended for skin types that are prone to dryness. Back home it really helped make my skin softer and more nourished, and I’m still using it now that I’m back in New Zealand. So in the morning I still only wash my face with lukewarm water, then apply this face cream and that’s it. In the evening, though, I decided to spice things up a little, especially because when I came back from Europe it was the middle of an uncommonly hot summer, which required me to wash off layers and layers of sunscreen every night. I'd seen the local vegan community writing good reviews on this particular face wash bar, so I thought I’d give it a go. It’s made of activated charcoal, French clay and peppermint oil, and it’s designed to remove impurities and fight blemishes, which I have a bunch of. It’s going down quite quickly and I can definitely see myself purchasing it again because I love it. After my face is all nice and clean, I take a homemade cotton round (find out how to make your own here), and I tone my skin with Thayers alcohol-free rose petal witch hazel toner (could the name be any longer?). This is definitely not a Zero Waste product but I’ve been wanting to try this toner for years and I eventually gave in - hopefully it’ll last me a long time. I really like it so far and my skin definitely feels cleaner at the end of the day. In those rare occasions when I wear make up, I would use a bar of African Black Soap, which is a bit drying for me so I need to make sure I moisturise profusely afterwards. However I still prefer to remove my make up with this rather than coconut oil, as I found that coconut oil makes me break out if I use it too much. (My homemade face scrub is still coconut oil-based, but I only use it maybe twice a month. You can find the recipe for that here.) Talking about scrubs, I also have this face polishthat I got from work, I’ve only used it once so far and it’s very gentle which I appreciate. As for moisturiser, I switch between a few products at night. The first one is my loyal and forever favourite Drink Up Intensive Overnight Mask by Origins, also not Zero Waste but I’ve had the same bottle since way before I even started thinking about reducing my impact on the planet. In fact, I purchased this baby in Canada back in 2013. I haven’t used it every single day, but man this face mask will last you! A tiny bit really goes a long way, and as I’m approaching the bottom of it I’m getting more and more torn on whether I want to repurchase it. I do love it a lot but it obviously come in plastic and - alas - Origins is not cruelty free (they sell their products in China). So yeah I guess the answer is pretty straightforward. I also got myself some rosehip oil, which I’ve had my eyes on for a while. Other than coconut oil, I had never used “liquidy” oils on my skin and I was very intrigued. I can’t say love it (I really don’t like the smell), but it does the job: the morning after my skin feels soft and nourished. I picked rosehip oil because it’s supposed to help with discolouration and even out your skin tone, but I don’t think I’ve been consistent enough in using it to see any results just yet. 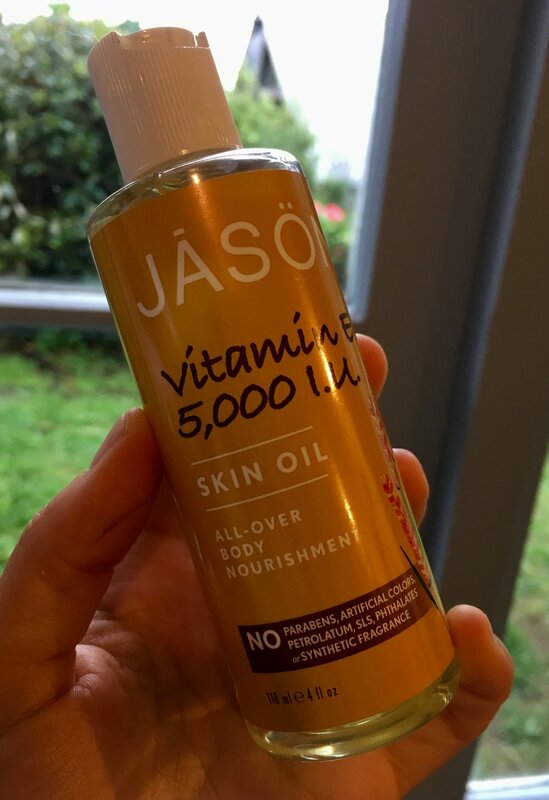 Talking about oils, the final product I’ve been using is Jason's Vitamin E oil, which I also got from work. (I should specify, I do get free skincare products from work, and that’s the reason why I have so much stuff. I’m experimenting, but mostly I wouldn’t go out of my way to purchase all these products, especially since most of them come in plastic.) Anyway, I haven’t been using this oil for very long but I am LOVING it so far. I might even dare to say it’s running right behind the Origins overnight mask in my favourite skincare products ever. Finally, I’m still using up the Queen Helene Mint Julep Masquethat I’ve had for ages, I’m almost out now but this is something I’m definitely not going to buy again. Its successor is going to be this Antipodes mask which I also got from work, I’ve used it once so far and I like it, although my favourite face mask ever will forever be Mask of Magnaminty from Lush, which I haven’t used since I ran out of it last year but I am considering getting myself some when I go back to London in October. Overall, my skin feels good. I regularly get a few pimples on my chin when I'm on my period but I know that's hormonal and there's nothing I can do about it. (Also this is new for me: I used to get pimples on my cheeks or around my nose, as well as some small bumps on my forehead, but only recently I started getting them on my chin. I wonder what it means?) I'm eating pretty healthy since I started working in this organic supermarket, but I also know food has nothing to do with the state of my skin. Finally, I'm not drinking enough water, which is also nothing new. So I'll probably keep all this up and will check back in a few moths.